Introducing MDaemon 18: Single Installer for All Licensed Features, AntiVirus Mailbox Scanning, and Much More! I’ve got some exciting news. Our latest & greatest MDaemon release is now available for download! With MDaemon 18, we introduce new features that benefit administrators and end-users alike. Let’s go over the top new features. You can view a more comprehensive list of all new features and enhancements in the MDaemon release notes. The MDaemon download/install file now includes all former plug-ins which are now “licensed features” of MDaemon that require a separate license key. When you enable each feature for the first time, a 30-day trial is activated. You can purchase a full license for these features on our website or through your local MDaemon reseller. Purchase options can also be found under the Help menu in MDaemon. DNSSEC is a technology that digitally signs DNS data so that you can be assured that it’s valid. It was created to combat man-in-the-middle attacks that are possible in the DNS system. These types of attacks can lead to users being directed to a hijacker’s own deceptive website in an attempt to collect personal data. To help ensure MDaemon does not become a victim of these attacks, it is now capable of requesting DNSSEC be used when available. 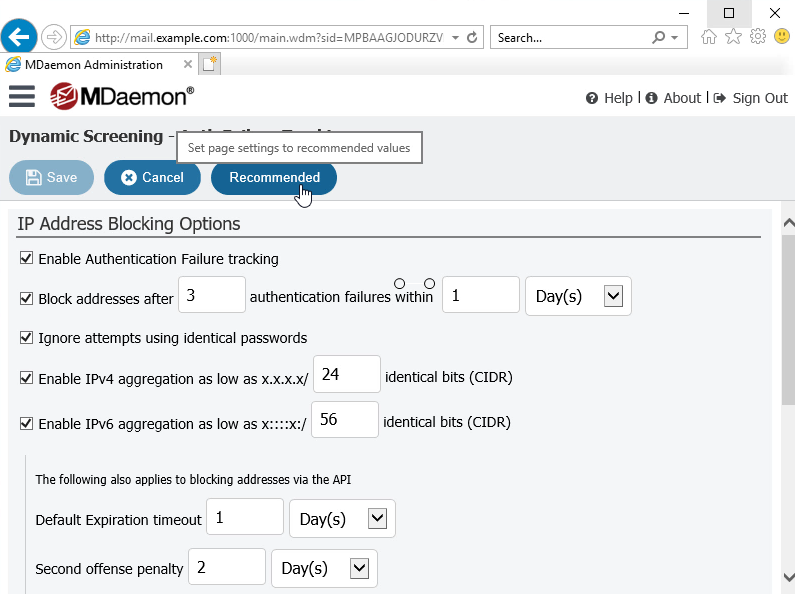 If you have adjusted MDaemon’s security settings over time and are unsure of the best settings for optimal security, you can now set each security feature to its recommended setting with a single mouse click in MDaemon Remote Administration. 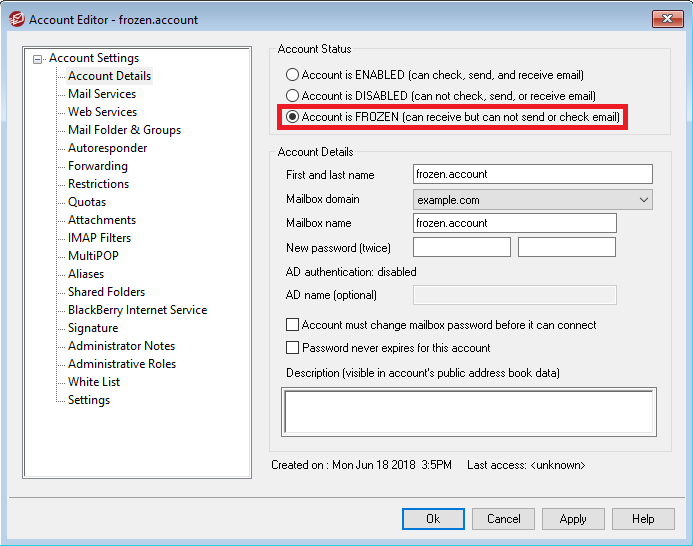 When MDaemon Antivirus is enabled, administrators can now configure a schedule to scan all mailboxes. This allows the detection of any infected messages that may have passed through before any new virus definitions were created to detect the latest threats. 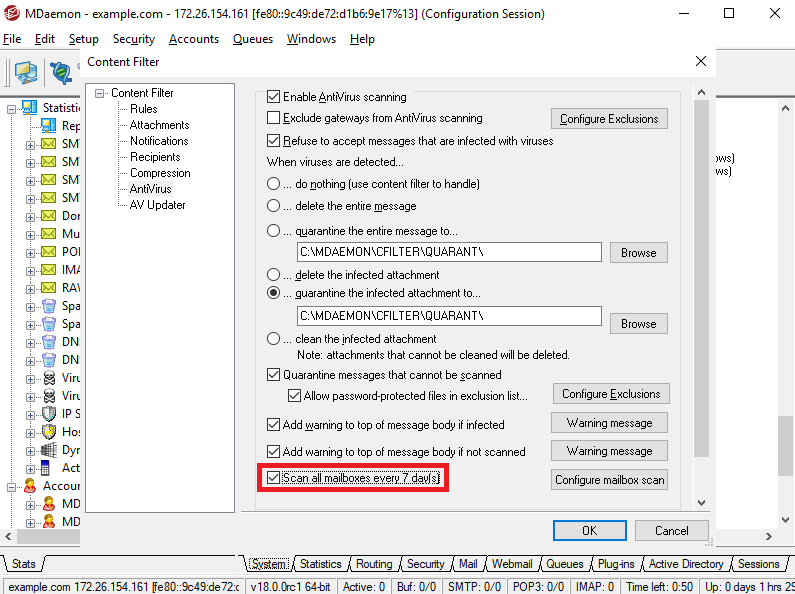 An option has been added to allow a previously known device to bypass location screening when connecting via MDaemon ActiveSync. 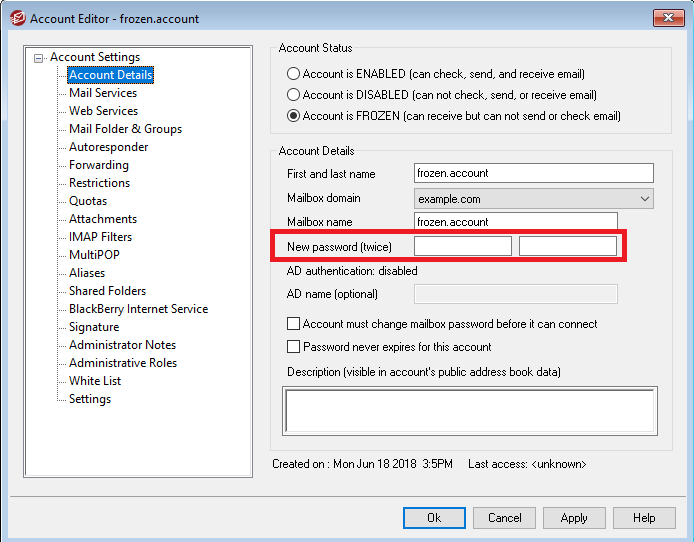 Administrators can enable this option to allow users to continue to access their account from locations that are configured to have their authentication attempts blocked. This is useful if you have users who are traveling and need access to their email. 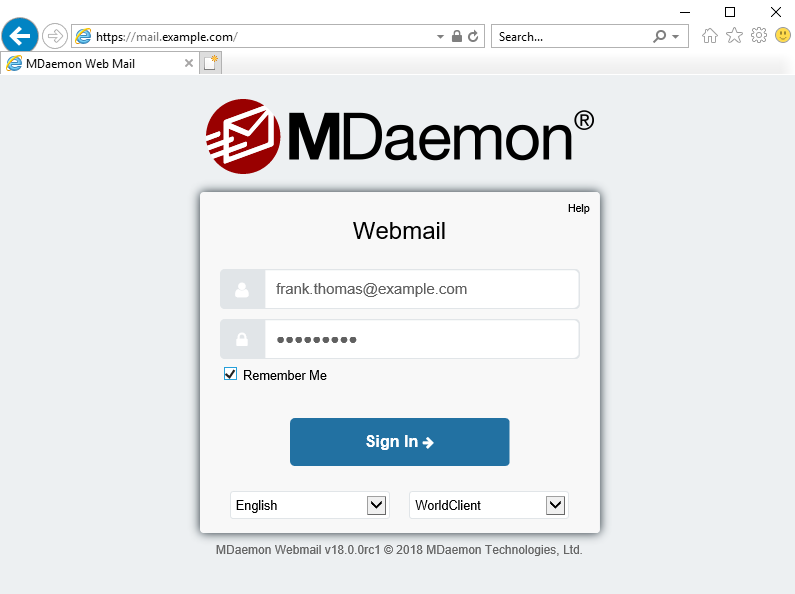 MDaemon Webmail and Remote Administration users can enable the Remember Me feature to automatically login without having to enter a username and password. The Remember Me duration can be configured by the administrator for up to 365 days. 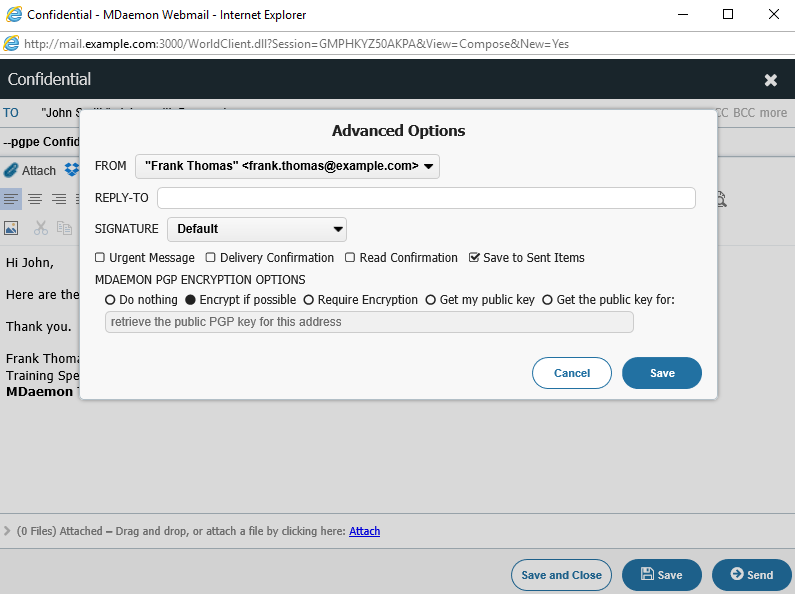 When composing a message, MDaemon Webmail users can use the Advanced Options screen to instruct MDaemon to encrypt the message, retrieve their public key, or retrieve the public key of another user (if available). 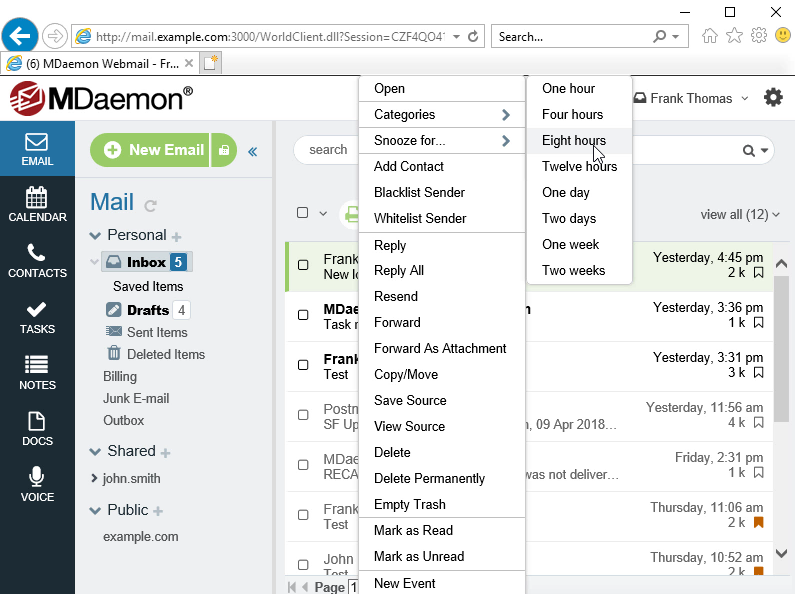 This greatly simplifies the process of sending secure, encrypted email using MDaemon PGP. 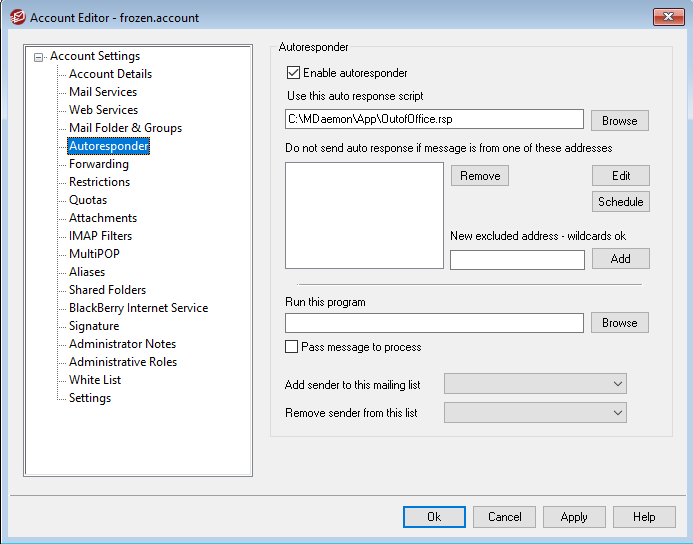 MDaemon Webmail users can snooze emails to temporarily remove them from their inbox until they need them. The user’s email will reappear in the inbox at the configured time, whether it’s tomorrow, next week, or when you get home. Snoozed messages can be displayed at any time using the View Snoozed Messages options. MDaemon Webmail users can publish a calendar to a publicly accessible URL for easy sharing and collaboration. For added security, these public calendars can be password protected. 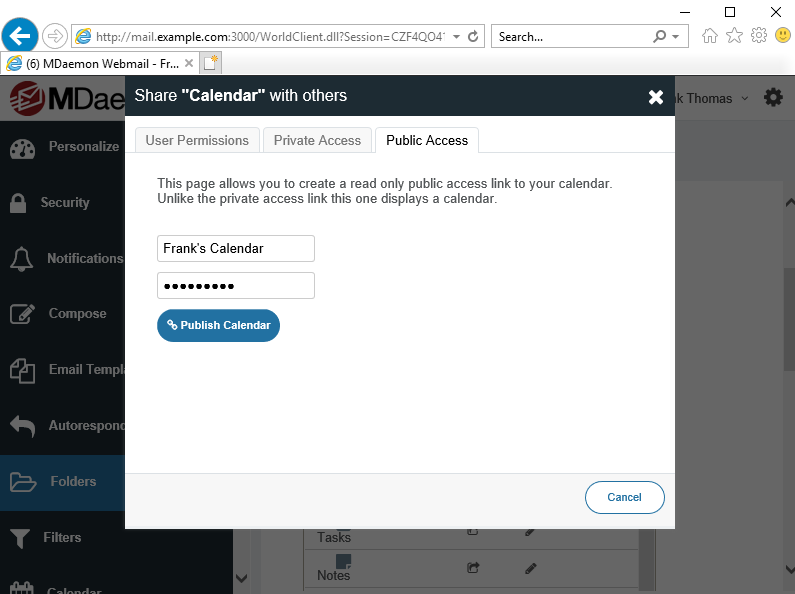 To publish a calendar, click the Share Folder icon for your calendar under the Options|Folders menu in MDaemon Webmail, enter an optional display name and password under the Public Access tab, and then click on Publish Calendar. Anyone who has the calendar’s URL and optional password can view it in their browser. 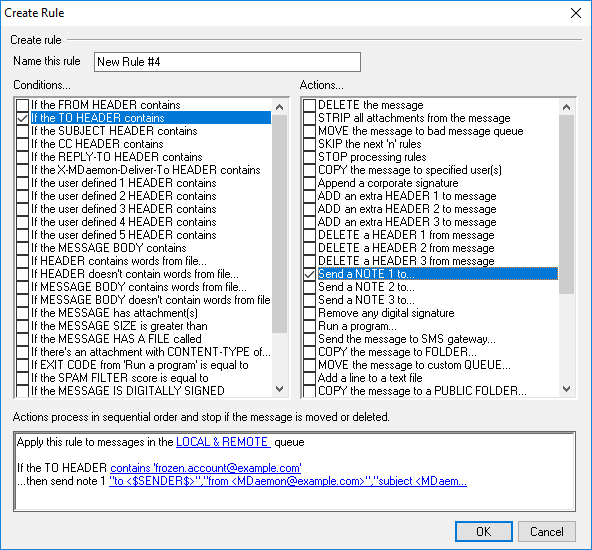 More information on how to enable this feature globally or on a per-user basis can be found in the MDaemon release notes. 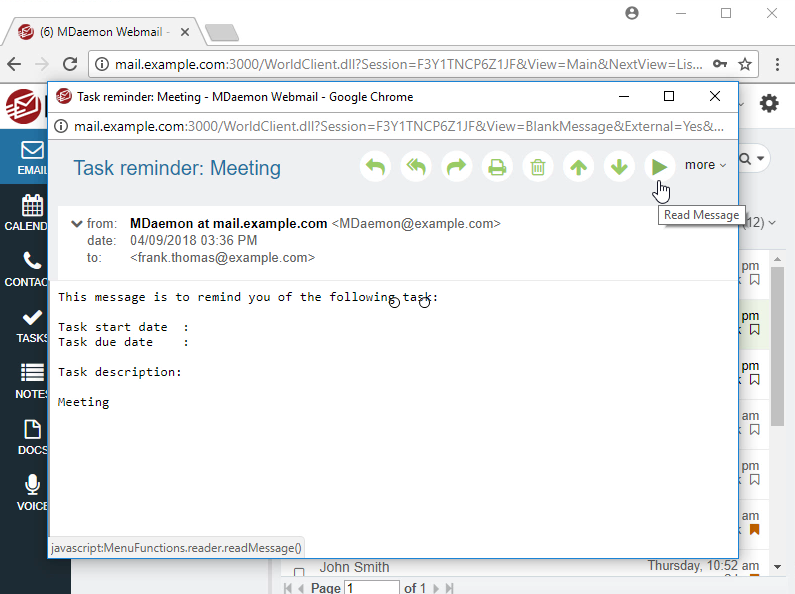 When viewing a message in MDaemon Webmail using the WorldClient, LookOut, or Mobile theme, users can click on a button to listen to the message. Note: This feature is currently only supported in Chrome or Firefox. 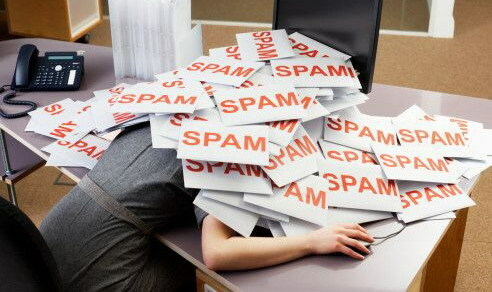 Are you running an older version of MDaemon or using a different email platform? Download the latest MDaemon & see what you’ve been missing! If you’d like to learn more about MDaemon & what’s new with version 18, or if you’re considering changing platforms for a simpler and more cost-effective email solution, here are a few links you may find helpful. As always, I’ll be happy to answer any questions via the Comments section, or if you need further assistance, you can click here to contact our Support staff. And one more thing while we’re on the topic of product updates. Is there a feature you’d like us to add to a future version of MDaemon? Click here & let us know! As we welcome in a New Year, we are also welcoming a new company name. Alt-N Technologies is transitioning to MDaemon Technologies. This change is now in motion and will be implemented gradually across our many company assets. We are adopting the new name to better leverage the brand equity and recognition we have built over the many years with our trusted email server. The new name will consolidate our brand and align the company around a globally recognized name. With the name change also brings the new tag line: Simple Secure Email. We believe this tag line summarizes the value many of our global customers and partners have expressed over the years and is synonymous with the attributes that have made MDaemon a popular email server with many IT professionals and resellers. We may have a new name but our mission and focus remain the same: develop features in our email server and email gateway products that deliver value (reliability, security, and flexibility) to the IT professionals that put their trust in us. For more than 20 years we have succeeded by listening to our global customers and delivering exceptional service. We treat our employees, customers and channel partners like family and we believe this is just one of the many reasons why we remain a trusted vendor in an ever changing and competitive email and email security market. We may not be the biggest company you will deal with, but we strive to be the best company you deal with! To our current customers we thank you for allowing us the opportunity to earn your business. To prospective customers, we ask that you give us a try. Download a free 30 day trial of our products or look at our hosted services and partners. 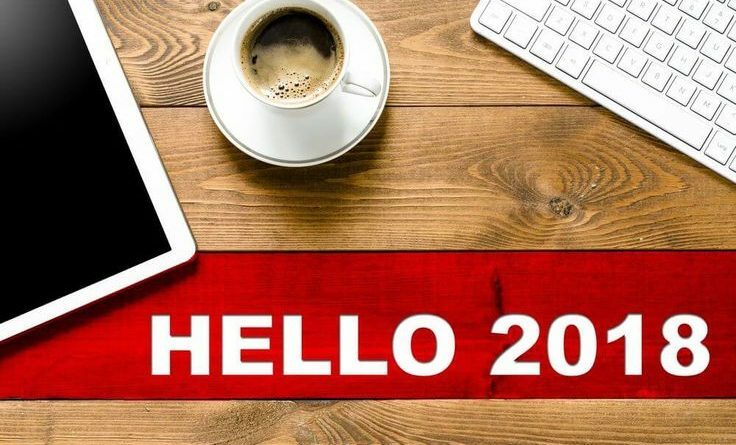 We look forward to an exciting 2018 and the opportunity to serve you!